Independently developed games continually seem to impress us, delivering remarkable quality despite the availability of very limited resources. Whether it is the engaging and original stories, surprisingly high quality graphics, or cleverly constructed puzzles, these titles sometimes have a certain spark about them that cannot be frequently found in the corporate world. Usually the work of a single person or a very small team, offered at very low prices if not for free, independent adventures can often feel as the product of people who truly enjoy the genre. [Adventure Lantern]: Can you tell us about your early experiences with adventure games? What were some of the games you first played? What were some of the things that made you enjoy the genre? [Eric McConnell]: I think unlike most long-time adventure gamers, I never really got into Zork. For me it was games like Deadline and Moonmist on my C64. It's ironic that Zork never appealed to me since I was heavily into AD&D (Advanced Dungeons & Dragons) at the time. You would think I would have liked the fantasy elements of Zork, but I really preferred a more realistic settings or horror for my computer games. Back then, to me the only fantasy settings (and rules) were AD&D, so I shunned any fantasy games that didn't adhere to those rules. It's foolish when I think about it now, but back then AD&D was THE fantasy game for me, anything else was a rip off - now I know better. Before AD&D, I played Avalon Hill wargames. Most notably Tactics, Rise and Decline of the Third Reich and Squad Leader. I enjoyed being able to step back and look at the big picture of what was going on. I resisted the AD&D trend when my friends were getting into it, believing that Squad Leader was the ultimate game where you could do almost anything, yet still wishing I could do more. Once I gave in to AD&D, I was hooked. THAT game was the ultimate in freedom and exploration where you literally could do and try anything. While I love all the genres, what appealed to me about AGs, well, text adventures at the time, was that it seemed pretty open ended. You could try so many different things and get various responses or outcomes. While games like LodeRunner were highly addictive, you had a pretty limited path to take. AGs, gave the impression of a much bigger world where your imagination and logic was key. [AL]: What would you say are the essential things that make a good adventure game? Which elements are most important to you as a player? [EM]: Getting absorbed into the story, interesting characters and intellectual stimulation. I can get into the whole inventory based puzzles vs. logic based puzzles, but I really don't have a preference. I enjoy them both. If it fits into the story, it doesn't matter. Same with the point of view - 1st person, 360 first person, 3rd, or full blown 3D. I think that's a developers choice of how he wants to present his or her creation. I've enjoyed all of the formats at one point or another. I do find it sad that some players will refuse to play a game based on the format, although for people who easily suffer from motion sickness, I can understand the aversion against 3D or 360 degree rotations. [AL]: What made you get into game development? Can you describe some of your early experiences? [EM]: I've always been a gamer and will continue to be one. All genres, all types (PC, board, pencil & paper, etc.). My early experiences all go back to those AH wargames, AD&D, the old Commodore 64 games and all the way up to current titles for the PC. I think it's only natural to want to create something yourself. [AL]: How would you describe Hidden Sanctum? What are your goals with the company? What kinds of games do you intend to deliver? [EM]: Right now it's me, two cats, and a one bedroom apartment. I've invested heavily in tools to be able to produce the games I want to do - 3d Studio, Photoshop, Premiere, After Effects, Afterburn, Audition, Dreamscape, powerful PC, Wacom drawing tablet, Midi setup, etc. It was important to me to have most of the tools that the big game companies have so that the only limitation I have is my own capabilities which is something that is constantly evolving. My goals right now are to start small and build a solid foundation to grow on. I'd like to be able to continue doing this full time, and will probably release a few smaller projects along the way. I'd love to do some strategy games, but coding AI is not one of my strengths at the moment, so it might be some time before you see anything like that. Adventure games will always be at the core though. [AL]: Hidden Sanctum recently released a casual game called Rune Rescue. Can you tell us a little about this project? [EM]: I wanted to do something small to get back into coding in C/C++. For the last 9-10 years, I had gotten away from it and was working primarily in Visual Basic for my job, so I thought it would be something small enough that hit on all of the major aspects of coding a game. In retrospect, I put a lot more time into it than I thought would be needed. I had prototyped 4-5 other games that looked good on paper, but really fell flat when you actually played them. Rune Rescue on the other hand was one where I lost a lot of time because I couldn't stop playing it. I'd run it to see if a code change worked and end up playing 10-20 levels before stopping myself. I wanted to create a game that fit into the casual category, but wanted to do something different at the same time from what is usually put out. [AL]: Do you intend to continue producing casual games in the future? [EM]: I'm not sure yet. There will probably be more downloadable games, maybe another puzzle game in the mix. [AL]: What can you tell us about your adventure game that is currently under development? [AL]: Can you give us some details about the story featured in Raven's Hollow? [EM]: I really don't think I can go into much detail here without giving some key elements of the story away. Hopefully there are enough tidbits in this interview to give people an idea of the direction it is heading in. [AL]: What about the game's locations? Can we expect a degree of authenticity? [EM]: Raven's Hollow takes place in a small village in New England during the late 1700's early 1800's. It's in Massachusetts near the Connecticut border. The time frame made for an interesting background history that's been incorporated into the story. There has to be a certain degree of authenticity to pull this off. 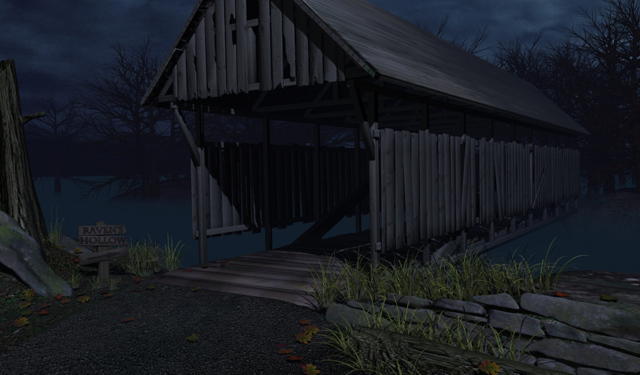 From the blacksmith shop, New England Church, covered bridges, the old coach that brings you to the village at the beginning of the game, the foliage, landscape, costumes, etc. People seeing screenshots will hopefully be able to immediately think of New England without having to read the text. However, at the same time I want it to be interesting visually so a bit of freedom has been taken to get away from it being 100% authentic. 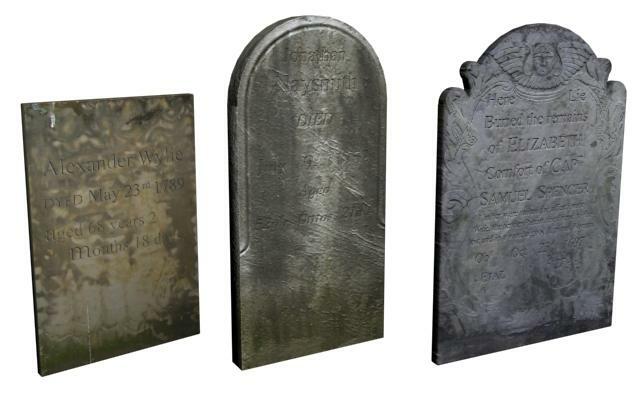 For example, the cemeteries back then consisted of primarily rectangular or rectangular with round top headstones made of slate. For entertainment purposes, this makes for a pretty mundane graveyard - creepy, but mundane. So in places like that I bent the rules a bit to make it more interesting. I want people to get immersed in the game and have fun, not run them through a history lesson. [AL]: What kind of an atmosphere can we expect to encounter? What style of horror will Raven's Hollow feature? [EM]: Expect it to be populated. There are plenty of locations in the game where the player will be isolated and alone in their explorations, but the entire game is not like that. I want to try and keep away from the somber and depressing feel of some horror games. Sure there will be some locations and parts of the storyline like that, but it won't be that way from start to finish. [AL]: What kinds of players would you expect to enjoy Raven's Hollow? Anyone who likes exploration and having a hand in a story that unfolds. While it is a horror game, it's intended to be a more well-rounded experience. The horror is not a constant throughout. There are periods of interaction with some unique characters, periods of calm, and periods of terror. [AL]: Who will be the game's main character? Will players have a chance to interact with any other characters? [EM]: The main character is in the employ of a businessman from Boston. Another employee was sent out previously to check on some properties and deeds in the area, but never returned. Whether or not they met with foul play is up to the player to find out. The main characters occupation gives a good excuse for digging into the backgrounds and history of the village. Interacting with other characters is key to the story. I'm not big on long-winded dialogs. I think you can tell a lot about a person just by their appearance, mannerisms and setting. You don't have to have them tell the player their life story in a seemingly endless dialog tree. While there are a number of people in the game, there are many isolated areas where the player is on their own. I think there is a nice balance there. I'm really hoping that the individuals the player meets will be memorable characters. I am horrible with remembering peoples name in games (and real life), so unless the characters are unique enough with their own little quirks, I have a heck of a time remembering who did or said what. [AL]: Can you describe the game's interface? How will players control their character and interact with the environment? Will Raven's Hollow feature a node-based navigation system? [EM]: I definitely am planning on 1st person point-n-click slideshow. For me at this stage, it does what I need. I really want the screens to be alive though, not static. The fog drifts, candles flicker, the trees swaying and leaves blowing in the wind. My goal is to have some movement going on with each screen. Granted, some screens based on where they are will not have any activity for obvious reasons, but the majority of them will be alive with some type of movement. 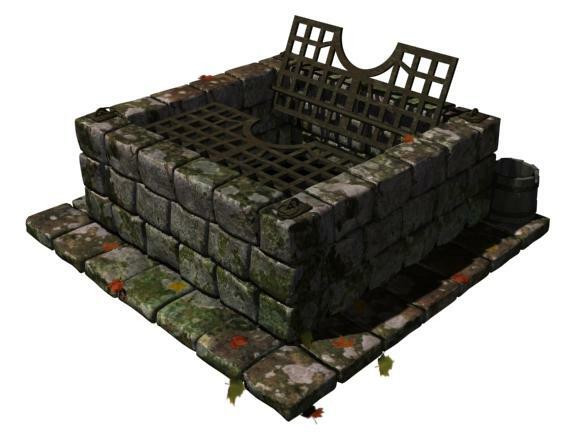 [AL]: What can you tell us about the puzzles featured in the game? Will the emphasis be on inventory-based challenges? [EM]: This is a tricky one. I'm really focusing on the story, characters and locations. As I develop them, the player challenges literally grow out of the landscape and situations that occur. I don't have a list of puzzles that I am trying to squeeze in somewhere for the sake of having a puzzle. Some are inventory based, others logic. This could potentially backfire. You have some players that refuse to try a game with logic-based puzzles and vise-versa. I'm really hoping that the game will not fit into any particular slot and will be judged on its own merits as an entire package. It's that freedom to create that has me pursuing this - getting locked into something to appeal to a certain group of players runs counter to that. [AL]: Do you have any other team members working on the game or is this a solo effort? [EM]: Right now it's just me. I was quite happy to find that there is a rather large underground scene here in Cleveland of indie movie makers. This led me to an indie horror movie convention that was going on here in early October. While developing Rune Rescue, I literally looked around the world for artists and musicians and cringing at costs. Game development is a VERY expensive undertaking - especially when you are just starting out and your only resource is yourself. Discovering that there is a huge amount of local talent right under my nose that I wasn't able to find previously has been a major eye-opener for me. Musicians, actors, writers, directors, artists, etc. There was this camaraderie they all shared and there seemed to be an underlying theme of "We all need to stick together and help each other out here. We don't have big budgets, just big ideas. You help me out here, I'll help you out there." Whether I will eventually be able to work with them down the road is up in the air, but just being able to discuss their projects and mine and feeling that creative energy was highly motivating. It was really an inspiring event and hey, I got to meet Jason's mother, Betsy Palmer, from the original Friday the 13th movie so how cool was that? [AL]: How has the development experience been so far? [EM]: A MAJOR learning experience with lots of hard lessons along the way. [AL]: What is the scheduled release date for the game? [EM]: Late 2007. It's pretty dependent on how well Rune Rescue does and a few other projects. If I have to go out and get another job because I can't sustain myself with the game development, then obviously Raven's Hollow will have to be pushed back. [AL]: Do you have any other projects you are currently working on? [EM]: Right now the main one is working on getting Rune Rescue out on to the game portals and working on another AG that is less involved than Raven's Hollow, so that one should be ready to go in late spring, early summer - it's actually surprising me how fast its coming together. There are a few smaller games I'm toying with, while putting the majority of time into Raven's Hollow. Raven's Hollow is quite a large game that will take about a year to finish. I've got enough money in the coffers to cover me for a few months, but not enough to be able to spend an entire year on getting Raven's Hollow finished so I have to get some other things out in the meantime. [EM]: Adventure games are the only genre where anything goes. Different themes, styles, formats, etc. You would think that adventure gamers would be open to new ideas and accepting of developers decisions to pursue one format over another. While they are quite diverse, it's disheartening to see various camps that have formed. 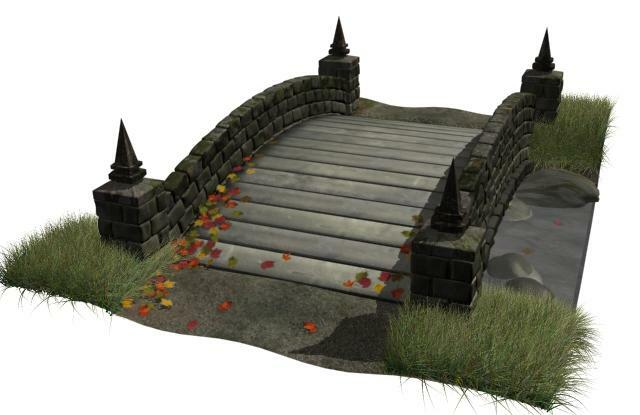 When players flat out refuse to play an adventure game because its in real time 3D, I find myself scratching my head. On one hand we all want to see the genre advance and explore new territory, on the other we want the same games that came out 10 years ago. On the other side of the coin, downing a game because it's like the ones that came out 10 years ago is just as bad. Everything goes, everything is valid, and each game should be judged on its own merits. Breakout and shoot em up games are still being made and no one is ripping on them for following the same format that has been in use for almost 30 years, yet they jump all over AGs for still using a 12 year old format - ridiculous. While I respect everyone opinions, I feel pretty fortunate that I can enjoy all the different genres and formats without being locked into one type. I think it was my tunnel vision during my AD&D period that taught me a lesson and I missed out on a lot of fun gaming experiences - I don't want to make that mistake again. Adventure Lantern thanks Eric McConnell for providing us information about Hidden Sanctum and his upcoming adventure game called Raven's Hollow. If the details Eric was able to disclose at this time and the preliminary screenshots are any indication, adventure gamers might be in for quite an interesting experience. Once again, an independent developer might impress us with a high quality product. 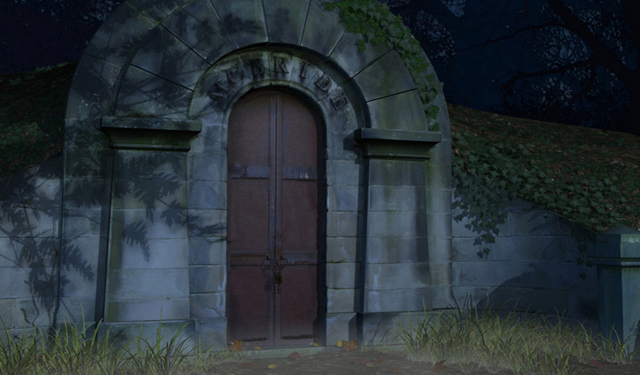 While you are waiting for the release of Raven's Hollow in 2007, you can visit the official Hidden Sanctum Web site at www.HiddenSanctum.com for more information about the company and its projects. 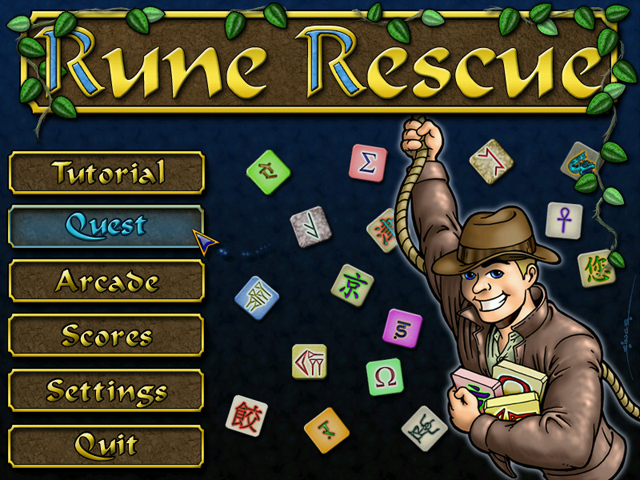 You can also try out the demo version of Rune Rescue or purchase the full game.